Is there an easy way to measure the height of a tree? I'm looking to get an antenna installed for Internet service that will need to clear some trees on my neighbor's property because it requires a clear line of sight to work. I really don't trust my estimating skills enough to plunk down money on a utility pole that might be too short or too tall. And climbing the tree with a tape measure (in my neighbors yard) is a bit intrusive and dangerous. Is there a clever way that I can get a reasonably close (within 5' or so) estimate of the height of the tree other than eyeballing it? I thought about putting together a bunch of 10' runs of PVC pipe and holding it up against the tree, but that is going to get pretty unwieldy by about 30' and the trees are at least that tall. 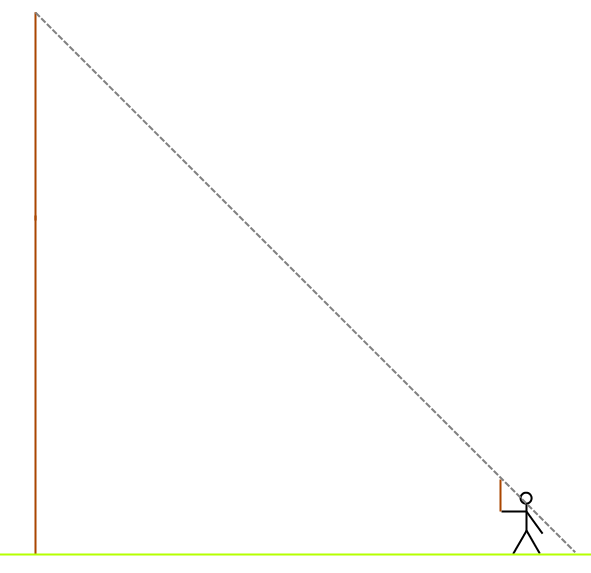 My other thought is to break out my old Trig textbooks and use the angle/distance to tree, but it seems like it would be pretty hard to judge the angle correctly, maybe with a laser pointer or something? Find a stick the same length as your arm. Hold your arm out straight and level with the stick pointing straight up (90° to your outstretched arm). Walk forward/backward until the tip of the stick coincides with the top of the tree. Your feet are now at approximately the same distance from the tree as it is high. (For a more precise approximation, back up by the additional distance of the height of your arm above the ground.) The relationship is true only if the tree is significantly taller than you are, and the ground is relatively level. Time-tested logger method. Simple. Calculate (tree's shadow * your height) / your shadow = ~Tree Height. You'll have to do this on a sunny day (you might also need an assistant), and the ground will have to be relatively flat (a slope will throw off the measurement). Take a pencil, move some meters away from the tree. Outstrech your arm and hold the pencil so that you can measure the height of the tree on the pencil with your thumb. Then turn the pencil at the bottom of the tree by 90 degrees. Note where the distance measured by thumb hits the earth and measure the way from this point to the tree. This is the height of the tree. You can do this with some basic trigonometry (bring your calculator), if you have a way of measuring the angle (eg, using a digital protractor, laser level that has a protractor/angle tool, angle ruler, etc). This method also works even if you are standing on ground that's at a different height than the base of the tree - eg, you can be on a hill, standing with your eye-level half-way up the tree and it will still work. Man there are some great answers here. I found one more on another site that I'll add for the sake of anyone else visiting this question. Get a piece of PVC pipe of known length (10' seems easiest). Mark at measured intervals (to your desired precision) on the pipe. Tie the pipe to the base of the tree or have someone hold it. Take a picture of the tree, standing as far away as you can, but zooming in as needed to make the tree the full height of the frame. Using a photo editing tool, copy the pipe in the photo and paste it on top of itself (stacking them virtually) to see how many it takes to equal the tree. Stand back from the pan until you see the top of the tree in the middle of the reflection. Measure from your eye level to the ground, straight down, can call it A2. From that point on the ground to the center of the pan is B2. You now have two right angle triangles that are proportional and only one unknown, the tree height (A1). A1/B1 = A2/B2 or A1 = A2 * B1 / B2. Or back in English, the tree height is your height times the distance from the pan to the tree divided by the distance from you to the pan. For example, if you're eyes are 6' above the ground, the pan is 40' from the tree, and you stand 5' back from the pan, you get 6 * 40 / 5 or a 48' tree. For more accurate measurements, get yourself on top of a step ladder or some other high point. Note that if you can't determine how level the ground is between you and the pan, you may be better off measuring from eye level to the pan and then do some geometry to get your height above the pan (A2 = square root(eye to pan squared / pan to foot squared)). Just use balloon with string or rope. Fill up balloon with smoke from cigarette (hot air), for example, or light gas: helium. Measure the length of string. just take a picture of the tree with some objects you know the height of in it (such as your wife of your neighbour). Then simply measure the height in pixels of known object and compare with tree. If you compare multiple objects, average results. The more "known" objects, the closer to the base of the tree, the better the result. Measure the distance between you (or any point of reference from which the tree is close and relatively visible) and the base of the tree. 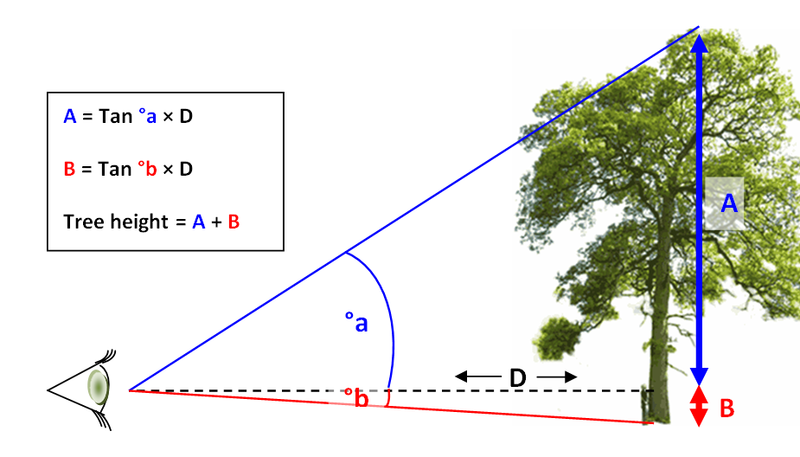 From the same point of reference, measure the angle in degrees between the ground and the top of the tree. A sextant is the correct tool for the job; if you have access to surveying tools you should be able to get a real one, or you can fake it by sighting down a level with an adjustable-angle bubble, or build a sextant using a straw, a protractor, and a weighted string. By definition, tan(theta) = height/distance. So, height = tan(theta) * distance. 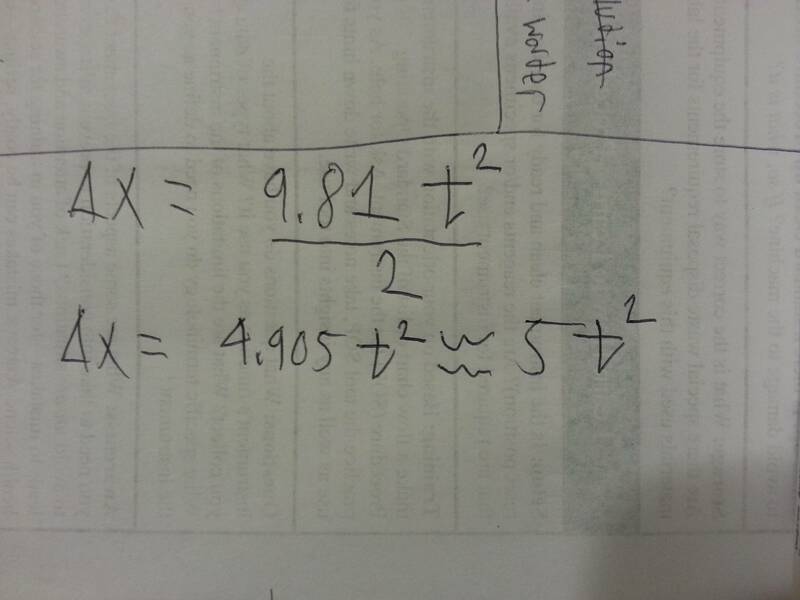 When using your calculator, make sure it's set to calculate sin/cos/tan in degree mode, not radian mode. Add your height to the number you get, if you were standing at the point of reference instead of lying prone, and that's as close as you'll get without climbing the tree to its top and dropping a plumb line. get a clear pipe and use level of water. Measure height at which you see water level from ground = tip of tree. For 2-3 points as far apart on your terrace as possible roughly on the same line as you want your antenna to be. Use basic trigo. Note how tall the tree is on the yard-stick. 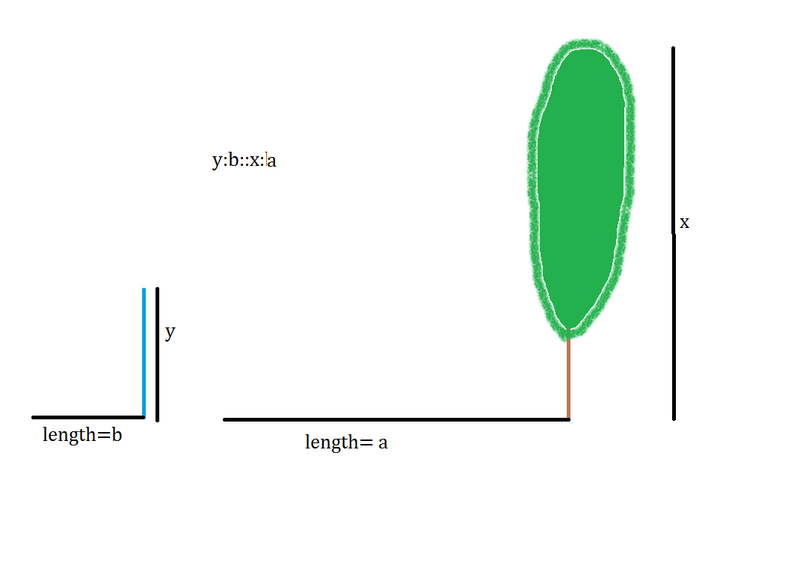 The height of the tree is ribbon distance multiplied by yard stick measurement. If the ribbons are 70" apart, and the yardstick measurement is six and an eighth inches, then the height of the tree is 70 x 6.125 = 429 inches = 36 feet. tilt the yard-stick forward or backwards. A ruler, tape measure, sheet of graph paper, sheet of lined notebook paper, or any object/straightedge with containing regular intervals, such as an egg-crate, piece of chicken wire, page of text such as page of newspaper, sheet of unfolded copy paper that had been folded in half repeatedly, venetian blinds ... will suffice for the 'yard-stick'. Instead of the ribbons, one could lean a pole, or 2x, or ladder or use select low tree branch. 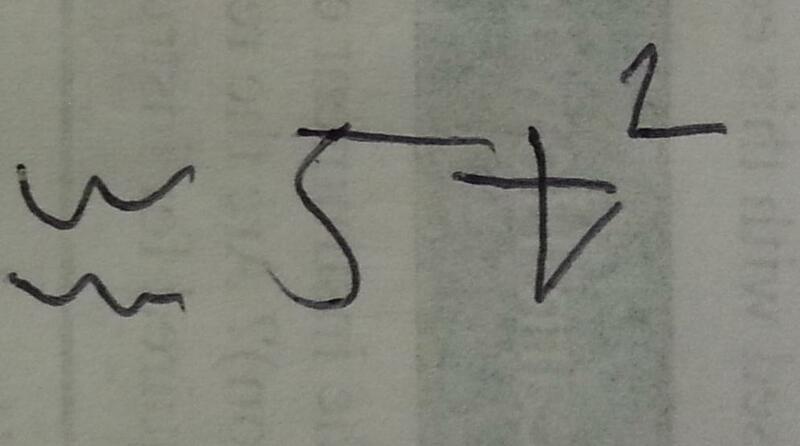 I personally find this to be much easier than trying to measure an angle, even if you have a transit. Use an open container of water, such as a bucket, the easy way. When standing, measure the height of your eyes, say 63". Fill a container with water, then measure the water depth, say 8". Subtract the two (55"). Walk away from the tree and find the spot where the reflection of the top of tree is in the center of the bucket when the bucket is on the ground and you are standing 55" away from the center of the bucket. This sets up 45 degree angles. Foresters use a clinometer to determine the height of a tree. Since another answer mentioned the use of a phone, I looked to see if a clinometer app was available for my iPhone. There are several and one has a very strong 5 rating. Good luck. Use an open container of water, such as a bucket, the ABC way. Set the bucket down a good ways away from the tree. Stand back from the bucket, positioning yourself such that the top of the tree is reflected in the middle of the bucket. For better accuracy, repeat the measurements and calculations with the bucket moved to a new spot as far away from the tree as the calculated tree height. Let's consider the height of the tree is x. Measure the shadow length of x. Take a Stick and measure it's height. Measure it's shadow too. Let's say stick is "y" tall and it's shadow is "b" long. Do the proportion. y:b::x:a. We need to find x. Do Y*A. Divide thaat answer with b. That answer is x and therefore it is the height of the tree. Climb the tree with an length of ethernet cable or fiber optics. Cut the cable/fiber at the bottom and terminate. Use a $15,000 Fluke Versiv cable/fiber certifier with a Time Domain Reflectomer (TDR) or Optical TDR to measure the height within a couple of wavelengths. This seems rather obvious, but if you fly a gps unit to the top of the tree, you can subtract the altitude of the base of the tree and determine the tree's height. The drone is by far the easiest method: measure the altitude of the base of the tree while setting up the drone, press the up button until your drone is hovering over the tree, and read off the altitude. This method is probably the fastest if you have multiple trees you need to measure. To augment other answers, if you need to know the angle towards something in front of you like a tree or a house or a hill or whatever, you can use the stars or other celestial bodies or even satellites. They all have a specific angle (altitude) at which they appear at a certain time from a certain spot on Earth. It can give you a high precision measurement without any tool. Maybe just the internet to figure out the values in planetarium software of websites. I had one that was more for fun than anything else. You can use a rock (Assuming that the height of the tree is within throwing distance, you can choose a small rock) and use the 1 dimensional kinematic equations from classical mechanics. That might sound kind of scary, but really just throw the rock as hard as you can and start counting seconds, and when you see it reach the top of the tree, and record this time. Not the answer you're looking for? Browse other questions tagged measuring or ask your own question. Is there a way to make reasonably accurate visual measurements? How to measure voltage in a duplex (three-way) wired switch? Is there an ideal height for a workbench? How can I measure the r-value of a wall? How can I accurately measure the angle of my walls? What is the easiest way to measure an irregular floor space? How do I measure the thickness of something with a lip or frame? What is the viewing window for on this tape measure?